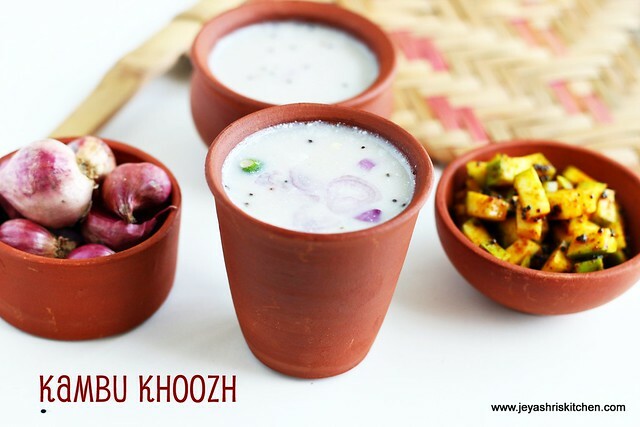 Kambu koozh is a perfect summer cooler. During our childhood days though amma makes it sometimes but i never liked it that time. But when i did this kambu koozh for the mangayar malar supplement book in Dec 2014, this millet recipe was one among them. I somehow liked it very much and it's an instant version of this pearl millet porridge. I used the bajra flour instead of whole bajra. Try this for your breakfast and you will be refreshed for the whole day. 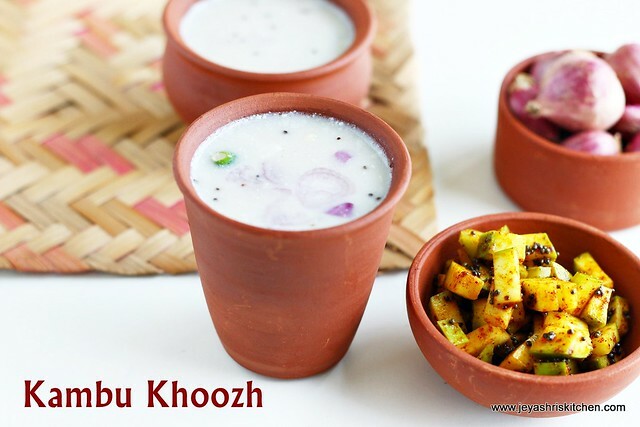 I made this not too thick but if you want you can make it as thick koozh . The cute pots suresh got me during his recent trip to Chennai. In a wide pan add the kambu maavu and add little water and mix this well without any lumps. Add the remaining water and cook this in a low flame. When it becomes thick porridge consistency switch off the flame,cover it and keep it aside. Let it sit for 5-6 hours. After that temper with mustard seeds and asafoedita. Slice the onions and green chili and if you want you can saute this in oil and put. I put them raw and mixed them well with hands. Discard the green chili after that. Churn the yogurt and add 1 and half cups of water to this. Add salt. Mix well using a whisk. I used a wooden mathu. You can keep it in the refrigerator and consume in the mid day too. I made early in the morning and had around 2.30 pm when i was sweating badly. It was quite refreshing for me . If you are using whole bajra or kambu instead of flour, soak the kambu in water for one hour and pressure cook this for 3-4 whistles. Bajra :water will be 1:4. Keep it outside overnight and mix with buttermilk the next day. This will be in semi thick consistency. You can have mor milagai for accompaniment too. Thengai thogayal too will be a best one to accompany this kambu koozh. 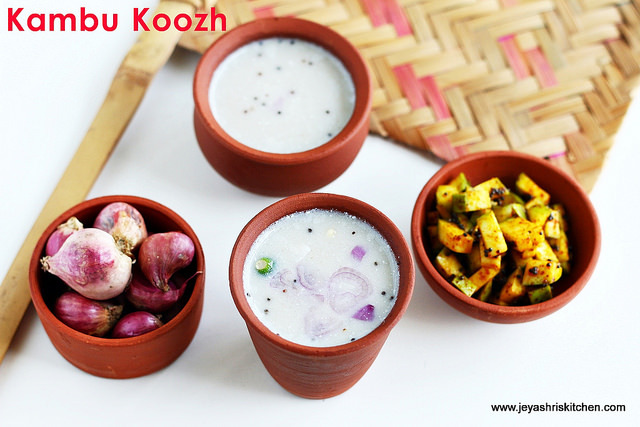 Koozh look super delicious with the manga oorukai..
Summer la enga oorla enga paathalum idhaan...koozh and those pickled mango looks so tempting! A new & interesting recipe..........useful clicks. Hi.... S d resting time needed? Can't we consume asap?